To say that Barret Robbins has been through a lot is a monumental understatement. Despite everything he’s been through and the mistakes he’s made, I do have a lot of respect for the ex-All Pro. He’s battled drug and alcohol addiction, prescription and pain killer drug abuse and fought bi polar disorder. He’s had run ins with the law, been shot a few times, and spent time in jail. Barret was even close to death and suffering from Pneumonia. A lot of it has been self destructive and sure, some guys you look at and wonder how they squandered all that talent, but Barret, I see as somebody whose life imploded right on the big stage under the bright lights, and they are just lucky to be here today. Robbins went to TCU collegiately where he cleared the way for the Horned Frogs offense. He earned the team’s award as their most outstanding lineman. 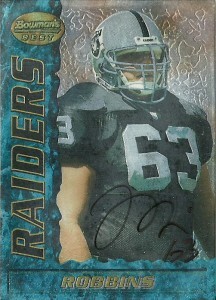 Drafted in the second round by the Oakland Raiders in 1995, Robbins became the 5th center in the history of the franchise, as only Jim Otto, Dave Dalby, Don Mosebar, and Dan Turk had held the honor, replacing Turk in the starting lineup in 1996. Robbins gave some nasty bite back to the position, clearing the way for guys like Napoleon Kaufman, Harvey Williams, and Tyrone Wheatley, while blocking for quarterbacks such as Rich Gannon, Jeff George, and Wade Wilson. Robbins never relinquished the starting spot at center until 2001, missing out on 14 games that season. In 2002, Barret had his finest season, being named AP and to the Pro Bowl in the Raiders last hurrah in the Super Bowl. Unfortunately the night before the big game, Robbins went AWOL. He was later found in Tijuana, Mexico where he remembers little to nothing of the Super Bowl or that night. The Raiders in the meantime dropped the game to the Buccaneers. 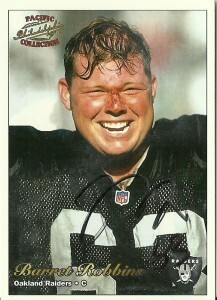 Barret played 9 contests in 2003, but did not finish the season and was cut by the Raiders in 2004. Tough times followed soon thereafter, but a lot of those monsters had been chasing him all along. While Robbins has continued to have issues, I hope that he has found peace in his life. When I looked into his eyes, I could tell that the man deep down is a good person, and that he genuinely wants to be seen as such, but just has made some dumb decisions that were hard to live down. 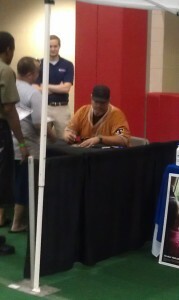 I asked him about the Texas gear he was wearing. He laughed and told me that I should know since he was born in Texas that it was hard not to have burnt orange blood and always wanted to go to UT as a kid. Not the greatest signature here, but still it is nice to grab him on a few cards. I wish Barret and his family all the best in their future wherever it may take them, and I hope people can gain some introspection on their lives and see from Barret’s example that you can survive almost anything. Previous PostClarett, MauriceNext PostMoses, J.J.